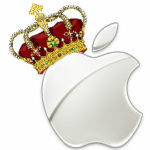 During Apple’s 2011 Q3 earnings conference call, it was revealed the company now has over $76.2 billion dollars in cash. In just a mere three months, their cash war chest increased from $65.8 billion dollars. 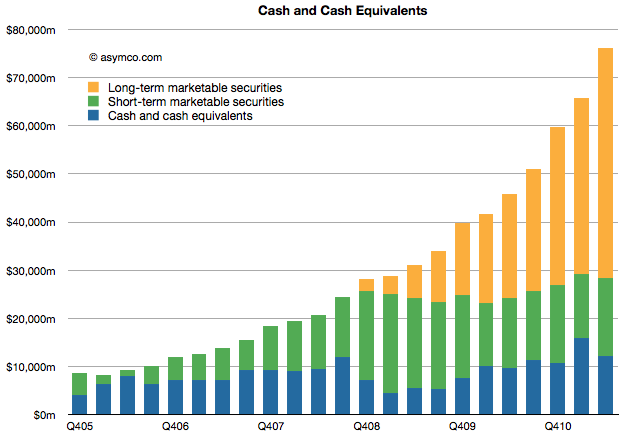 Asymco notes the cash acquired during this quarter is more than what Apple had on hand 4.5 years ago. The cash alone was higher than Google’s revenues in the quarter too. The WSJ notes Apple’s cash on hand is worth more than the GDP of 126 countries around the globe, including nations like Ecuador, Bulgaria, Sri Lanka and Costa Rica. If measuring market capitalization, at $359 billion, Apple is the second largest company in the world, trailing only Exxon Mobil. What should Apple do with all this cash? Apple already apparently leverages its billions in cash to stay ahead of its rivals by coming up with exclusive deals with suppliers. Investors have once again raised the question of issuing dividend payouts.